Vibrant, vividly coloured and attention grabbing, the Carlie is a kaleidoscopic display of mixed stems. Enrich the senses with this bouquet featuring citrus yellow and saffron orange Asiatic lilies, luscious red roses, sapphire irises and gerberas in a warm reverie of fiery red, outback orange and sunshine yellow. 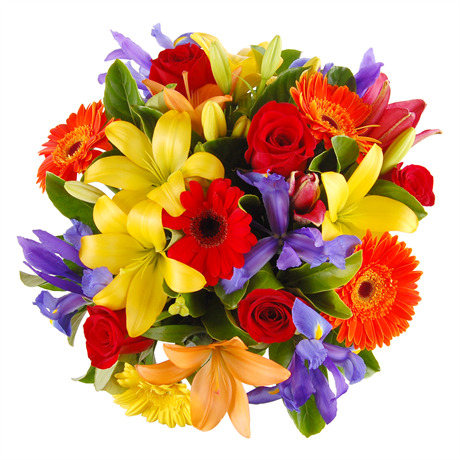 This carnival of colour is designed to brighten the day of those lucky enough to receive it, and is one of our most popular bouquets purely for the reaction it elicits. We recommend adding special touches to this bouquet like a stylish vase, or perhaps a bottle of celebratory champagne. It may take mere minutes to organise the Carlie, but the surprise of receiving it creates a memory that is not soon forgotten. Give this moment to someone you love- they deserve it.